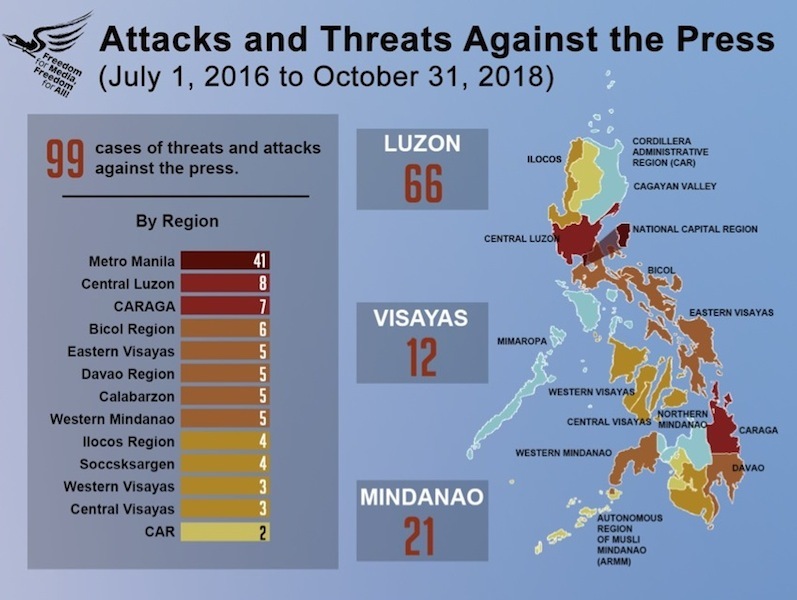 By islands of the country,66 cases were recorded in Luzon, 12 in the Visayas, and 21 in Mindanao. 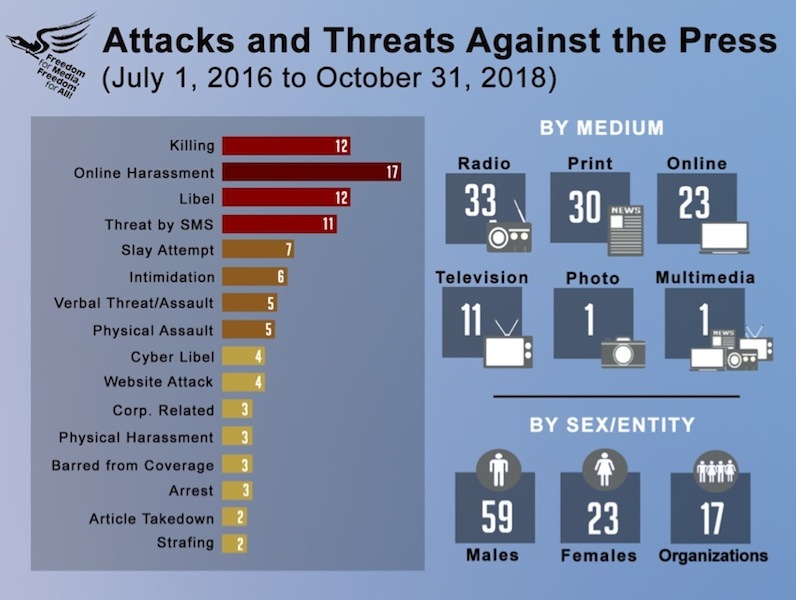 JUST two weeks after President Rodrigo R. Duterte assumed office on June 30, 2016, newly-elected Surigao provincial board member and broadcaster Apolinario Suan Jr. became the first journalist to be murdered under his administration. Suan, a radio anchor at Real FM station in Bislig City, Surigao del Sur, was on his way home from the radio station when men aboard a van attacked him along the national highway in Sitio Tandawan, Barangay San Vicente, Bislig City on July 14, 2016 at around 2 in the afternoon. Suan slipped into a coma and died two weeks later on July 28, 2016. A friend* of Suan told the National Union of Journalists of the Philippines the broadcaster had hurled hard-hitting commentaries against Bislig City Mayor Librado Navarro even before he was elected as board member of the province. Suan had also received death threats before he was killed, the source said. LARRY QUE publisher and columnist of the community paper Catanduanes News Now, was the second journalist killed under the Duterte administration. Que was shot dead by motorcycle-riding men as he was entering his office in Virac around 9:30 a.m. on Dec. 19, 2016. 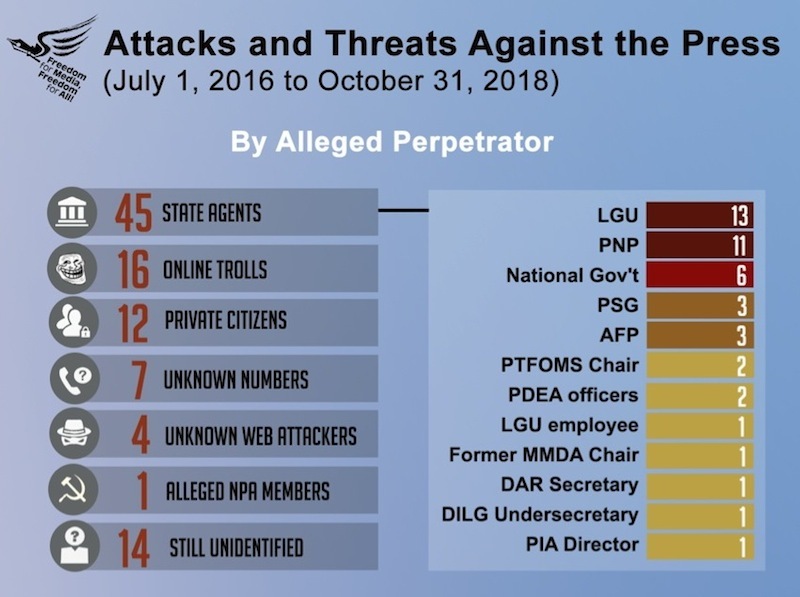 On May 2, 2017, Que’s partner, Edralyn Pangilinan, filed a murder complaint with the Department of Justice in Manila against Catanduanes Governor Joseph Cua, police officer Vincent Tacorda, Cua’s aide Prince Lim Subion and several “John Does”. NORTHERN LUZON lost its first journalist under the Duterte administration when Mario Contaoi was shot dead by motorcycle-riding gunmen on the national highway in Barangay San Ramon, Magsingal town, Ilocos Sur evening of Jan. 7, 2017. MARLON MUYCO, who hosted a blocktime program over dxND Radyo Bida in Kidapawan City, Cotabato province, was shot dead by motorcycle-riding men in Barangay La Suerte, M’lang town, afternoon of Feb. 2, 2017. REMATE columnist Joaquin Briones, who had also worked as a commentator of station dyME, was gunned down by motorcycle-riding men as he was heading home around 8:45 a.m. on March 13, 2017 on Bombom Bridge, sitio Feeder Road, Barangay Bacolod, Milagros town. Broadcaster shot dead in Zamboanga del SurRUDY ALICAWAY, 47, was on his way home on Aug. 6, 2017 after hosting his weekly community affairs program “Tigmo-tigmo” over radio station dxPB when motorcycle-riding men shot him dead in Sitio Lopez, Barangay Culo, Molave town in Zamboanga del Sur. He was the first journalist to be killed after President Rodrigo Duterte declared martial law in Mindanao on May 23, 2017. 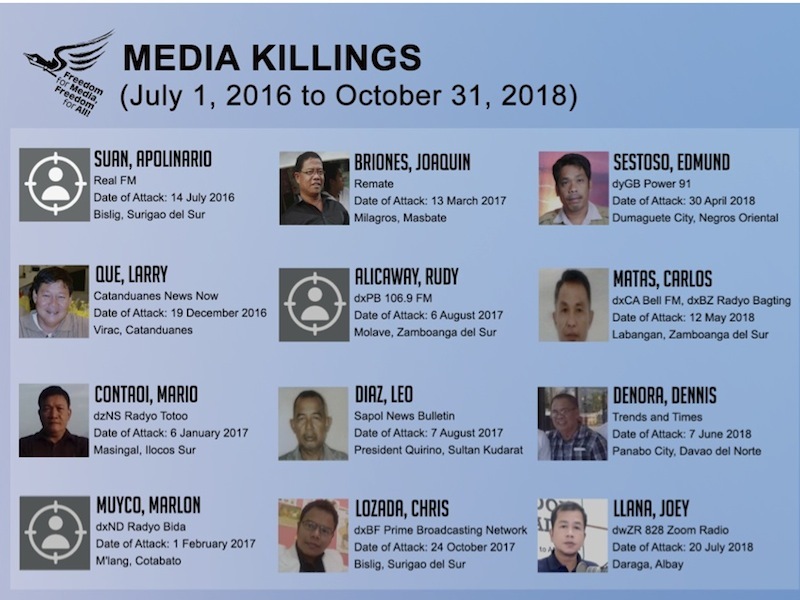 ON AUGUST 7, 2017, Leodoro Diaz, 60, of President Quirino town in Sultan Kudarat province became the second Mindanao journalist to be murdered after the declaration of martial law in the southern island. On Oct. 23, 2017, the Office of the Ombudsman ordered Navarro and 11 others dismissed from the service over the alleged anomaly. BROADCASTER EDMUND SESTOSO, former chairman of the National Union of Journalists of the Philippines chapter in Dumaguete City, was shot by motorcycle-riding gunmen late in the morning of April 30, 2018 and died the afternoon of the next day, May 1. Matas, 61, a retired soldier who hosted the local program Zamboanga News Patrol on station dxCA, was gunned down as he was visiting Barangay Nuburan in Labangan town around 2 p.m. on May 12. Four days before he was killed, Matas was ambushed on his way back from a visit to Langapad, also in Labangan. He reported the incident to the police and tackled it on his program on May 12, before the killers eventually got him. 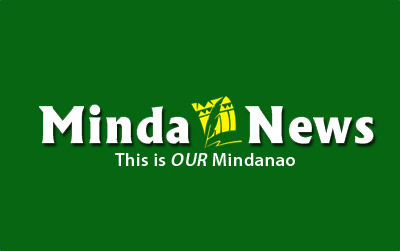 A PUBLISHER and writer of Trends and Timesbased in Panabo City, Davao del Norte, was killed in an ambush by an identified armed men on June 7, 2018 at around 1pm. Denora had attended a meeting of Davao Multimedia Group in Tagum City before he passed along Panabo Market where he was attacked. His driver was injured in the incident. Prior to the attack there has been no report of any threats against the 67-year old journalist. A hard-hitting radio broadcaster was shot dead by five unidentified armed men at around 5 in the morning on July 20, 2018 while he was on his way to the radio station along Barangay Penafrancia, Daraga town.